Reception for "Jewish Pioneers of New Mexico": The New Mexico Jewish Historical Society invites you to a Cocktail Reception: viewing of the pioneer panels, short program to present educational curricula, and a chance to meet representatives of pioneer families and the organizations making this exhibit and future programs possible. 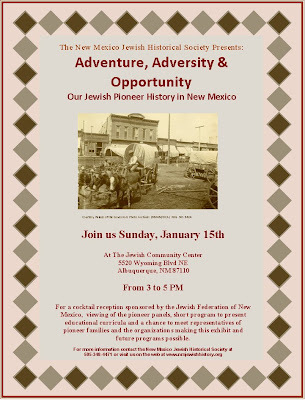 Please join the NMJHS at the opening reception, for an exhibit of ‘Immigration and Occupations of our early New Mexico Jewish Pioneers’. Some 40 panels of the “Jewish Pioneers of New Mexico” exhibit, originally displayed at the Palace of the Governors in Santa Fe (2000), will be shown as part of a pilot educational program for middle school students and future traveling exhibits around New Mexico. 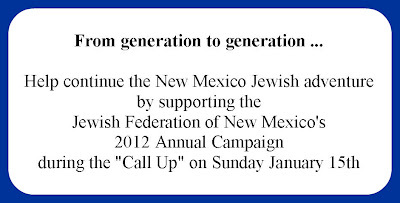 Info: Please contact the New Mexico Jewish Historical Society at (505) 348-4471 or visit the NMJHS on the web at www.nmjewishhistory.org. Sponsored by the Jewish Federation of New Mexico.